FAOBMB bids farewell to Professor Andrew Wang who is stepping down from his term in office as Past-President of FAOBMB (2014-2015). Professor Wang served as President-Elect in 2010 and was President of FAOBMB from 2011 to 2013. In appreciation of his extended services to FAOBMB, he was honored by Professor Kiyoshi Fukui, the current President of FAOBMB, on 27 November 2015 during the 14th FAOBMB Congress in Hyderabad, India. 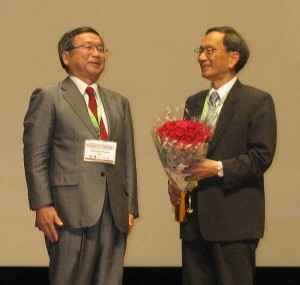 Professor Kiyoshi Fukui (above left), presented a bouquet in appreciation of the sustained contributions to FAOBMB made by Professor Andrew Wang (above right) . Professor Wang was also treated to a farewell luncheon the following day by members of the FAOBMB Executive Committee and Council together with members of the Congress Organizing Committee. The photo (above) shows assembled guests with Professor Wang (seated, fourth from left), next to Professor Ch. Mohan Rao, Chair of the Congress Organizing Committee (seated, fifth from left). Professor Wang was recently elected as President-Elect of IUBMB. He will hold this position until 2018, when he will begin his term as President of IUBMB until 2021. We thank Professor Wang for his generous contributions to FAOBMB and wish him well in his future role with IUBMB. He has served our regional organization with distinction and we look forward to working closely with Professor Wang and IUBMB.